Oden is Japanese hot pot with fish balls/fish cakes. Oden is a popular winter dish. Easy oden recipe made with Mizkan (bonito flavored) soup base. Every year, when Fall arrives and the air gets crisp and the weather cools down, I look forward to hearty stews and nourishing soups. One of my favorite fall/winter recipes is Oden, a Japanese stew or “hot pot” made of dashi stock and an assortment of Japanese fish balls and fish cakes. Oden is my must-order item at my favorite izakaya—a seasonal dish available during the fall and winter months. There are many variations of oden, but my favorite is the ones with hard-boiled eggs, konnyaku (a chewy plant-based gelatin), daikon, kombu (seaweed), and various types of Japanese fried fish balls and fish cakes. I especially love the hard-boiled eggs, which has the subtle taste of the oden broth. Traditionally, oden is made with dashi, or Japanese cooking stock. While you can make home-made dashi stock, many home cooks, including those in Japan, are turning to premium quality soup base for convenience because there is dashi in the soup base. As a busy mom who is constantly pressed for time, I am all about using a good substitute without sacrificing the taste and authenticity. I made my oden with Mizkan (Bonito Flavored) Soup Base and the taste doesn’t pale in comparison to the oden I had in the Japanese izakaya. It was every bit delicious, comforting, and utterly satisfying. This season, try making oden for your family. It’s a perfect dish to bring everyone around the table, sharing good food and making great conversations. Rinse the fish cakes and fish balls (which are mostly fried) with running water, remove the excess oil from the fish cakes and fish balls. Drained and set aside. In a pot, bring the water to boil and add the Mizkan (Bonito Flavored) Soup Base and the kombu, about 5 minutes. Add the eggs, daikon, and konnyaku into the pot and boil for another 10 minutes. Add the fish balls and fish cakes into the soup and turn the heat to low. Simmer for 30 minutes and serve immediately with Japanese mustard (karashi) or shichimi togarashi. There are many kinds of Japanese fish cakes and fish balls. Find those pre-packed for Oden. Some fish cakes and fish balls are saltier and might make the soup a tad salty. Please add some water and bring the soup to boil if the oden is salty. Traditionally, oden is simmered for 1-2 hours. My version is the quick and easy version. Ernie – oh yes, I love daikon, too. It makes the soup so much tastier and sweeter. Yummy! Seeing the recipe for Oden brought back many memories of my childhood! When I lived in Japan, we used to go to this side street ramen shack that had Oden and my brothers and I used to eat like 5 or 6 sticks each of everything from daikon to konnyaku to tofu to the egg. My mother, sadly passed away 3 yrs ago, but I hope to someday return to Japan to reminisce all the things that made me happy as a child. Thank you, Bee for sharing some of my favorite dishes. You are such an inspiration to me and I am so thrilled to have stumbled upon your website! I LOVE Oden!!! It tastes better the next day when all the favors from the broth seeps into the daikon, tofu and yam cake! YUM! Yes, hot pot such as oden tastes the best the next day. Mmmm, now I’m craving oden! This looks fantastic, and I love how easy your recipe is! Yes, making oden is so easy and fast. yep, cold days,are here again……finally got your cook book…wow !!! !i am impress… you really make it easy… everything is there… i will have fun this winter…thanks..
Hi Carol, thanks for your support. 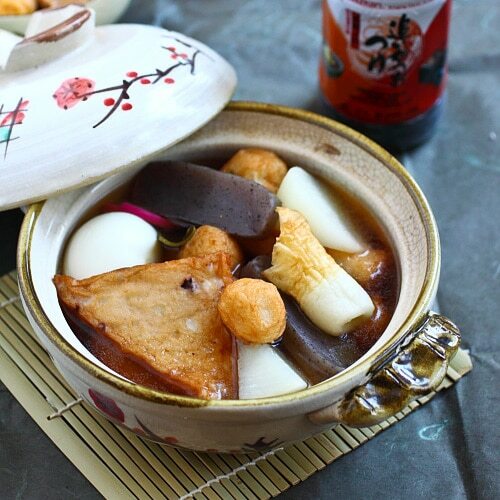 You have to make this oden for your family this winter! I’m Taiwanese and love oden. We call it a different name back home in Taiwan. The recipe seems easy and I love the konnyaku, which is very good for your health. I’ve never eaten this before but it looks really good, and I’m inspired to make this too! I haven’t come across Mizkan bonito soup base in the shops before though. How can I substitute it? If I can, I would make the oden in the morning to have for dinner. The house smells like oden and can hardly wait for dinner. It taste like left over from the night before. Super yummy and the eggs are really the best. Looks absolutely delicious! Definitely a winner dish for the autumn! Yes Leemei, oden is delicious! Japanese stews are very new to me, but bowled over by its simplicity and loved the flavor in it. I am inspire to try it soon. Japanese stews are great, very clean in taste and wonderful, hope you get to try this recipe soon! You mentioned kombu in the “method” however, it is not listed under “ingredients”. So, do we add kombu? What is kombu? Thanks for catching the omission, I have updated the recipe. Kombu is Japanese dried seaweed.